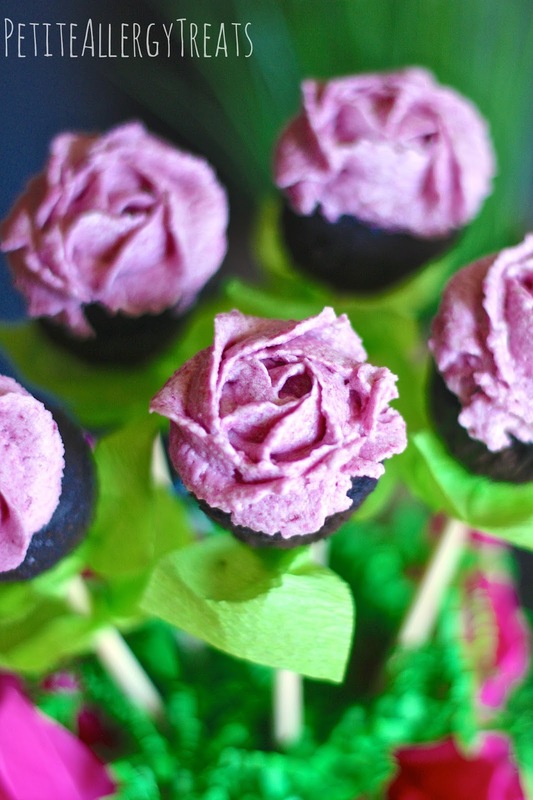 I’m so excited to be sharing this Gluten Free Mini Cupcake Bouquet with Blueberry Frosting. They are also dairy free, soy free, Vegan and free of the top 8 food allergens. If you love cupcakes as much as we do, you will find all of the best gluten free cupcake recipes and more on this blog! Hi Everyone, it’s Laura. I’m so glad I could be here to help out one of my favorite blogging friends whose daughter has been ill. All the anxiety when your child is sick, especially when that child is sick for so long…It’s a parent’s job to worry, isn’t it? 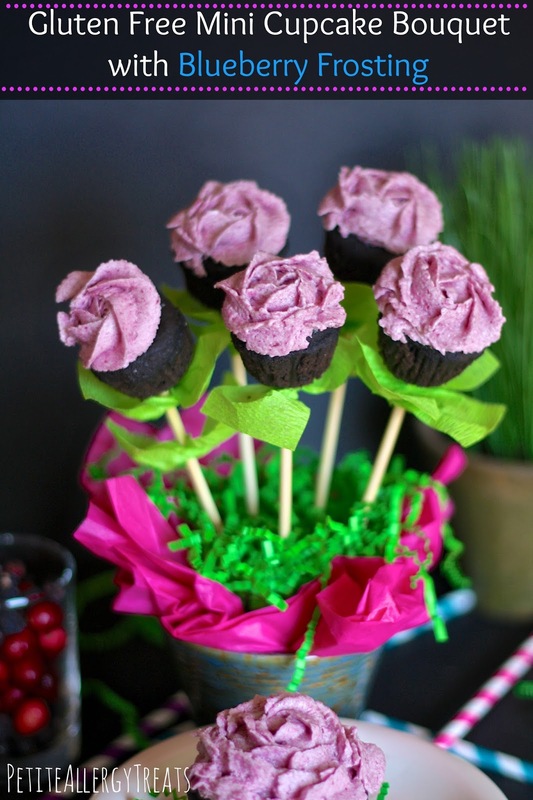 This gluten free cupcake bouquet is just the thing needed to bring some cheer! This cupcake bouquet is perfect not only to bring cheer, but these cupcakes are a wonderful way to welcome spring, celebrate special events, or add some pizzaz to a dessert buffet table. Here’s a Mini Cupcake Flower Bouquet to brighten anyone’s day. You won’t believe how easy it is to create your own gluten free cupcake bouquet…I used the same chocolate cupcake recipe from my Double Chocolate Cupcakes with Cranberry Frosting. These cupcakes are moist and chocolaty and perfect for this recipe! You will want to use a mini muffin tin to make small cupcakes for this recipe. Large regular sized cupcakes will be too heavy for the skewers. Allow the cupcakes to cool while you make the blueberry frosting. What frosting tip is best for piping roses? This frosting different because it needed to be smoother for piping roses. I used a 2D closed star tip by Wilton. I’ll tell you now, practice makes perfect. This is the first time I’ve ever really tried to make a pretty cupcake with frosting. (Not that my other cupcakes aren’t pretty). How do you make a frosting rose? The frosting rose is pretty simple. Start by squeezing frosting in the center of the cupcake. Squeeze straight up and then turn in a circular fluid motion. Gently push down the tip and stop squeezing to finish the rose. This cupcake bouquet is put together with simple wooden skewers that I dressed up with some paper grass and cray paper for green petals. These also look wonderful as regular cupcakes if you don’t need to fancy them up in a bouquet. The mini cupcakes are a bit harder to decorate since they are smaller but the effort is so worth it because these cupcakes are so stinking cute! Gluten Free Mini Cupcake Bouquet with Blueberry Frosting! 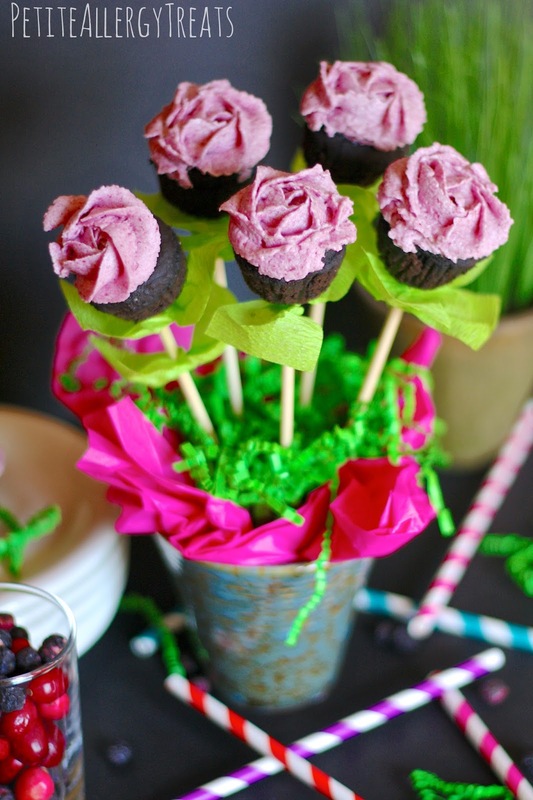 Delicious gluten free cupcake bouquet made of chocolate cupcakes with a blueberry frosting. Combine all dry ingredients and use an electric mixer like the Oster 2500 Inspire 240-Watt 5-Speed Hand Mixer to mix well. Add milk, maple syrup and oil. Mix by hand or with a mixer. Make sure all lumps are gone. Add vinegar last, and immediate pour batter into lined cupcake tray. Bake mini cupcakes for 10-13 minutes or 12-15 minutes for regular cupcakes at 325 degrees. Makes 24 mini or 12 regular cupcakes. NOTE: this makes A LOT. Freeze the leftovers to use when ready. Slowly add half of the powdered sugar and milk in small amounts. Add vanilla and blueberry powder. Beat in high for another 3-5 minutes. Slowly add the remaining sugar and milk and beat until incorporated. Using a 2D closed star tip pipe frosting on the center of the cupcake. Squeeze upward first and then in a circle. Practice first on some wax or parchment paper. Oh wow! This is adorable! That is such a great idea for a spring holiday dessert! What a pretty way to display cupcakes! I bet they are delicious too! These were so stinking cute! The taste and texture are great too! I have always wanted to make a cupcake bouquet. I love the color of the frosting. wow looks so beautiful blueberry cupcake idea and frosting recipe is easy to make it home.. Thanks so much for sharing this awesome recipe with Full Plate Thursday. Your cupcakes are just beautiful! Hope to see you again soon! I am amazed that blueberries made the frosting pink. I would have thought blue. These are so cute. Thanks for the comment Charlotte. They are super cute. The pinkish color may be the amount of blueberries used, I am not sure but I will ask Laura. Thank for letting me share this with all your readers. It was so much fun creating this for a great friend! Everyone is loving this, and I have had many comments about your photography. The set up is adorable. Thank you so much Laura. These are a definite hit!! This is a gorgeous bouquet! Perfect for Mother’s Day too, or any day! I agree. 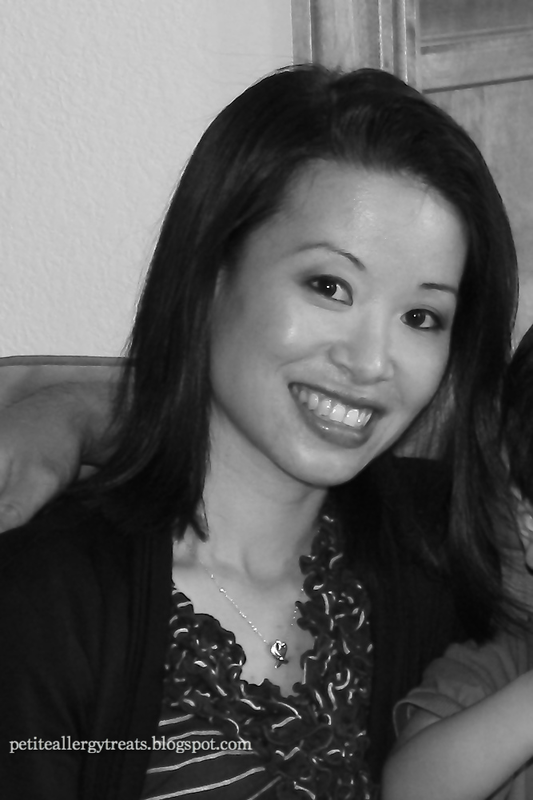 Laura is incredible how she comes up with this allergy friendly, yummy recipes for her kids. I hope you enjoy! !